Today, we have achieved further success. 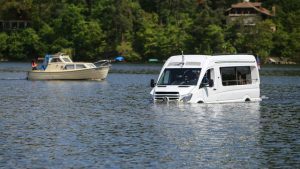 The production of amphibious minibuses is about to start here in the Czech Republic. In these minibuses, Puroxit floors, which are the product of our company, are being installed. These minibuses can be used e.g. in recreational areas, or they can also be a great support for rescue workers during floods. 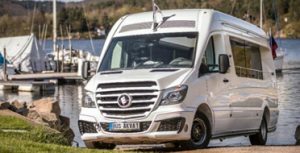 The minibus similar to the Mercedes Sprinter can hold up to 12 passengers and can be used both on land and in water. The moment that a driver drives into the water, they switch the car into a sailing mode and then they only keep a correct direction or a speed using a small joystick on the door and turning a steering wheel. To control the car in the water, a certificate of competence for small boats is sufficient. To drive the car on roads, one would need a driving license of category D.
Currently there are going to be produced a maximum of 5 pieces per year. However we believe, that the production of these special vehicles, will grow over time.